Phnom Penh is a pleasant city so it's counter-intuitive to recommend the Toul Sleng Genocide Museum and Choeung Ek Killing Field as must see attractions. Once you are in the city you realize the local resident’s friendly nature and positive outlook outweighs the city and country’s horrific, not so distant past. The city has other sites - The Grand Palace / Silver Pagoda complex and Wat Phnom - but it’s the recent sites that leave the more memorable impression. Signs of the country's optimism and expanding economic freedom. Can be seen along Sisowath Quay. 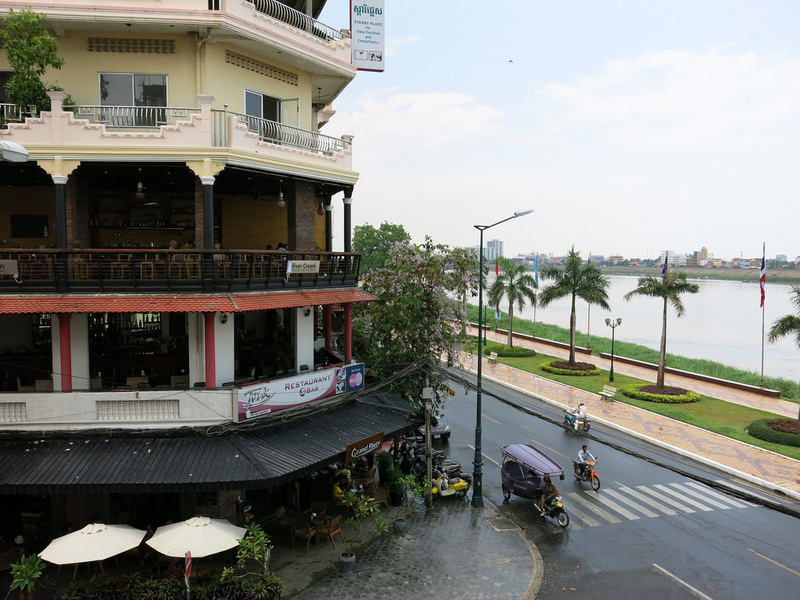 The Quay is a spectacular stretch of multi floor cafes, bars, and restaurants along the Tonle Sap waterfront - a reminder of Cambodia’s French colonial past, although with the heat its more practical to drink an Angkor Beer instead of a cappuccino. Sitting on the third floor balcony at the Foreign Correspondents Club over looking the hundreds of Cambodians whisking by on their motorbikes and in cars on their way to Brown Coffee or a Khmer New Years celebration you realize that the city may have moved on and doesn't dwell on the past. There’s a purpose to the Cambodians activity that suggests that while they understand the horrors of the past, they moved on and look forward to the future. You shouldn’t forget the past but it shouldn’t define who you are either, thus one can truly state that Phnom Penh is a pleasant city. Following the Khmer Rouge’s 1975 takeover of Phnom Penh, in an unintentionally symbolic maneuver, a local high school was converted into a prison to detain and torture the urban intellectuals who did not fit into Pol Pot’s vision of a peasant, agrarian society. The Toul Sleng Genocide Museum has retained much of the prison in it’s original form and a walk down the hallways and between classrooms show the hastily manner in which the school was converted into a prison. Other classrooms contain photos of the prison’s residents creating a hauntingly personal experience. Further afield from Toul Sleng and Phnom Penh lies Choeung Ek, one of Cambodia’s many Killing Fields. Due to the makeshift nature in which the Killing Fields were constructed little remains of on-site facilities but walking through the mass grave sites and hearing the audio tour of personal accounts of Killing Field experiences paints a very gruesome picture. It’s not simply the volume of people killed (approximately 2 million people, 25% of the population, in a four year period) but the manner as evidenced from the skulls in the on-site pagoda memorial. The Royal Palace and Silver Pagoda are two splendors from Cambodia's imperial past. Both sites are in a single complex easily walkable from Sisowath Quay. Continuing beyond this area from Sisowath Quay leads to the Independence Monument and middle class neighborhoods. For additional Phnom Penh photos see FLIKR ALBUM.